As I drove to today‘s destination – a prison for men age 14-27 in Berlin, Germany, I found myself in what looked to be a fairly typical Berlin neighborhood. A mixture of houses, apartment complexes, stores, community gardens and light industry. I turned the corner, and a complex of large, somewhat aged buildings were surrounded by fortified walls, ringed in high, barbed wire spools, tall octagonal guard towers protruding at even intervals, while a gaggle of young musicians were grouped (the French ones smoking, of course) in front of the main entrance. We were the musicians of Musethica, an international music festival which embeds older, seasoned musicians with younger, cusp-of-career musicians to learn from one another, and interestingly, to visit and perform in unusual community locations. We had already played for schools for disabled children, a cancer ward, a home for the deaf and blind, a Psychiatric hospital, and now, on our final day, a visit to the prison, located in the NW of Berlin, close to the Tegel International Airport. I have played in prisons before, in the States, which are striking in their state-of-the-art surveillance, security, and buildings which are so different in design from other, civilian buildings – you really feel like you have stepped into a different universe. And the inmates look to be an entirely different breed of human – thick necks, heavily tattooed, people who would scare the bejesus out of you if they were sitting next to you on the airplane, or teaching kindergarten. Here, I was a bit unsettled by the lack of any of the above. Sure – we had to go through pre-clearance, give our passports, and leave our electronics in the lockers at the entrance. But, I didn’t see any screens, cameras – we weren’t scanned, our instrument cases were not opened – no metal detectors or series of loud beeps or automatically sliding bars. There were only guards, their dark blue jackets emblazoned with the word „JUSTIZ“, with huge key rings, attached to their waistbands with a retractable cord. I wouldn’t have blinked twice if any of the guards or inmates were a barista at my local coffee-and-cupcake joint, or guitar teacher for my 7 year old. We were first led to a staff break-room in the building used to house those young men awaiting trial. The buildings themselves looked, really, no different from so many others in Berlin – long three storey, brick buildings, somewhat worse-for-wear. The cell block itself, and for that matter, the inmates and guards, all looked straight out of a 1950’s American movie – the thin but very long main corridor (everything painted light grey) flanked by rows of solid locked cell doors, the center of the floor completely open to the two identical cell floors above (albeit with metal netting which would prevent objects from being thrown), series of crisscrossing metal stairs, and gates separating the cell block into 3 sections. We were set up in the very center of the ground floor, and inmates were arranged around the opening, one floor up – as if we were being inspected under a microscope – our audience was directly above us. They were closely watched by guards, but the main prison office staff stayed separate – closer to us on the main floor. All of the young men looked very clean-cut, and were definitely, by first look, much darker than your basic Berlin population (I later found out that about 60% of the population is born outside of Germany, for what that’s worth). Their outfits, also, felt somehow staged. Vibrant blue overalls, grey-and-white stripped shirts, and optional grey overshirts were regulation until every day at 13:00, after which you could opt for issued dungarees, grey sweat pants, maroon t-Shirt and jeans jacket. Every inmate had his own little style-flare. Rolled-up cuff, one overall strap down, pullover draped in an interesting way. “What an amazing costume department“, I thought to myself. With the inmates languidly draped over the bars just above us, I nearly expected a rendition of “Jailhouse Rock“ to spring forth. But, the almost palpable lecherousness (at first I thought I must be imagining this, but when I mentioned it to the others, they immediately agreed) of some of the guards, and the clicking of tongues by the inmates as our female students entered the performing court (something which had a much darker than normal feel here – a feeling of imminent danger or willingness to do harm), I began to feel queasy. One of our students, who was to open by playing a baroque movement, was wearing a dress which, I realized, because of the birds-eye-view of our audience, would perhaps make her self-conscious. I quickly asked her if she might be feeling a bit cold, and offered her my zip-up fleece, which was gladly taken. As we played, I heard a blood-curtailing scream, accompanied by the sound of metal being pounded on by metal. Guards were dispatched, and as one screamed interruption ended, the same sound was echoed in another part of the cell block. These cries continued sporadically throughout the performance, with the sounds of guards’ feet, doors slamming and forceful reprimands. I am not sure if it was people wanting to get out to hear the performance, or a desire to disrupt, or what. But it was the start of a deep feeling in my stomach which didn’t abate for days to come. You see – the inmates didn’t look, to me, any different from the students I was playing with. They were the same ages, same build – they all had sparkling eyes and, I am sure, dreams of the future. But something had gone terribly wrong somewhere along the way, or conversely, something had gone right for the students. I naturally gave the inmates the benefit of the doubt – weren’t they just “normal“ kids, caught in the wrong place at the wrong time – or out of desperation doing something to make money for their families – something they didn’t want to do, or something they wouldn’t have done if they were raised in a different set of circumstances? When I wasn’t playing, I climbed the stairs to sit close to them – to feel what it felt like to be them, looking down on us. After that first performance, I asked a guard to show me an empty cell, and he obliged – single rooms, solid door, very small, barred window high up, one cot, one table, one chair, one set of drawers, and a toilet and sink behind a curtain. 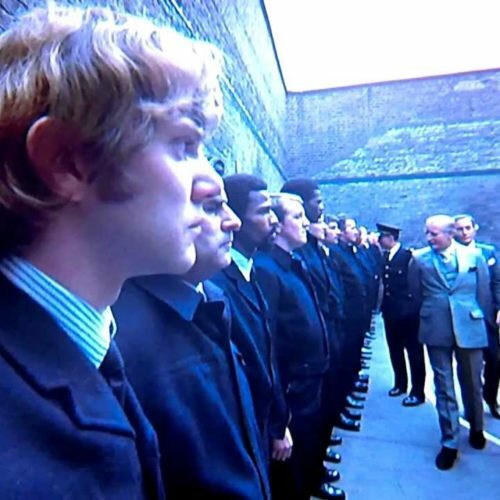 The next two performances were for a group of men in the carpentry building (quite open, light, and spacious, where the guard asked me to play the Peer Gynt Suite and the opening music from Das Boot) and a group of high-school inmate/students. Again I sat with the inmates while we listened to the Chaconne and Haydn Quartets, and was happy to answer questions (they always liked the fact that I was from Chicago – asking me to play the theme from The Godfather). At the end of one of the performances, an inmate asked if we could play something sad. I saw him, as we played the slow movement of the Mendelssohn Octet, bow his head, and wipe tears away as he silently cried. I asked the social worker what they were in for – imagining small-time, non-violent crimes (otherwise, wouldn’t there be more security, more separation between us and them? The guards let me sit right between the inmates when I wasn’t playing). She said they were mixed – drug possession, robbery, murder – one of the boys had killed a pregnant woman in the woods. Was that one of the boys I had shaken hands with? Was that the boy who asked to hear Mozart? Everything felt close – I couldn’t breath – I excused myself, and a guard walked me to a staff bathroom. I just needed air. But, really, I thought – isn’t much of classical music an exploration of the things we imagine and desire which are unacceptable or illegal in society? Don’t I, with the full collaboration of the other violinist, stab a woman to death in the Janacek Kreutzer Quartet? Don’t we profess our deepest, darkest thoughts, often ones which are salacious or destructive – names of our mistresses hidden in the score, or the choosing of a young girl for a sacrifice, who dances herself to death? Or all of those things we feel and process which have no words – the things that are so deep we can’t share where our minds are taking us. These composers – what stopped them from acting on their desires? What stopped any of us from acting, and what didn’t stop these boys? These are some of the topics that came up between the musicians after the day spent in prison. It was one of the reasons that the week with Musethica will stay with me for a long time. I will never know if I shook the hand of a person who killed a pregnant woman in the woods, and I will also never shake that feeling that I am, in some way, myself, guilty as I take my bow and stab a woman, again and again, in the Janacek String Quartet. Those boys will never have a chance at a normal life, caught as they were by their own circumstance and personal devils. We, as musicians, have the ability to work out our devils through our music, and the obligation to share our music not only with those people willing to put on a decent pair of pants and spend 15 euros on a concert ticket, but also to those who only have one pair of pants, and whose hearts and lives are forever entrapped. Superficial title for such an upsetting article maybe? The titles are composed by the Slipped Disk desk – it was certainly an upsetting experience, and one which will stay with me forever. But it got you in the door. Anthea: One of your nicest and most meaningful experiences and writings. Loved it!! Thank you Anthea for being a part of this performance. We have no idea how your music has affected and stays with those who heard it, just as your experience stays with you and has affected you. I’m so glad you had the opportunity as part of that group. Beautifully written, and profoundly moving. Thank you. Indeed, and hard to read with dry eyes. Anthea – Your best (and most chilling). Felt like I was there with you. I believe that this netting is mainly intended as an anti-suicide measure. We’re so used to our talk about “music expressing the most raw emotion, the most forbidden desires,” etc., at a safely metaphorical remove. Depicted onstage it’s all “safe;” even if you have past experience of it in real life, you can tell yourself that this isn’t real, or step out to the lobby for a minute (or simply choose not to go). I can’t imagine what it must be like to have that layer of metaphor stripped away, and to find yourself face to face with the real thing. — Except, thanks to this thought-provoking column, maybe now I can a little bit. thank you Anthea for beautiful emotional playing and writing. Was great to be there with you and to share the experience that music doesn’t really know where its being played. Avri – this is a beautiful thing you have created and nurtured. People have been asking for more information – can you tell us where to look? Where you will be next? My prescription for these inmates and the world in general is to listen to more HAYDN. No tortured soul to be found, just positive warmth, profundity, lightly held genious, and the joy of life.